This is a relatively simple tag, but I love the colors and the look. Tim used sticky back aluminum. I decided to use Ten Second Studio metal (the back side of an ugly color which is silver). Embossed it with another new embossing folder I recently acquired (Sizzix "Winter Botanical" set). Painted it with various acrylic paints, when dry, sanded the high points, then adhered it to a white tag. I just got this boxed pastry gift at work, and I saw the ribbon around the box, and said "I'm taking that home". I enjoyed the butter cream little pastries inside too... BIG GRIN. So I tied one of my peg bows with this gorgeous wired ribbon and attached it to the tag with Tim's tiny attacher. 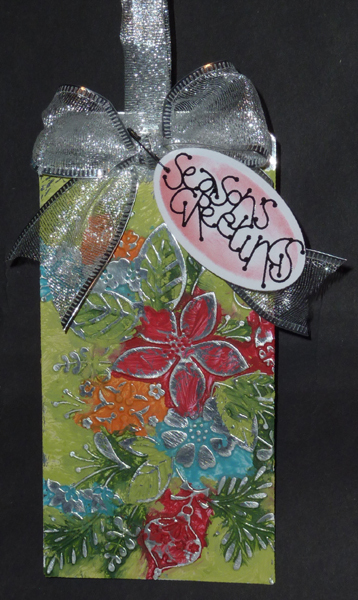 The words are one of my calligraphic Peel Offs from the label of Els Craft Designs. 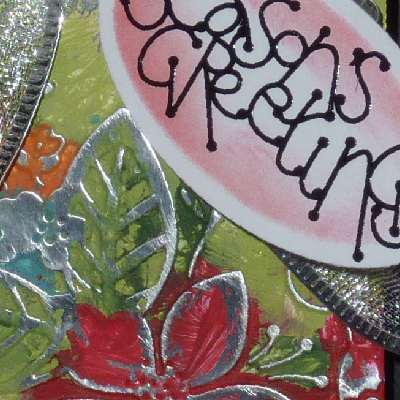 I put it on some white cardstock, cut it out with a Spellbinders Oval die and sponged some Distress Festive Berries around the edges. Punched a small hole and attached it to the tag with a mini black anodized safety pin. Wow! Yogi, this is just gorgeous1 I love how you did your silver! Beautiful!! Fabulous tag...I love your take. The way the paint spills over the design is fabulous on the flowers!!! Yogi- I'm so impressed with your "Tim" tags and that you are keeping up. I would have to do Christmas in July to keep up. No hope this time of the year! !